This Beaver Weather Vane, Castor canadensis, native to North America, comes with a nicely textured copper fur coat and is pictured perched on a birch log. The log can be made either of copper or brass (the price is the same either way). The Beaver comes with brown glass eyes, which lends it animated and life-like appearance. You can elect to have the birch branch sticking up above the waterline (as shown here and indicated by the horizontal copper tube beneath the branch) or the beaver could simply perch on the branch itself, sans copper tube (the price is the same either way). We can also make the branch with or without little leaves. We wanted our beaver to capture the quintessential industriousness of these busy creatures, known for the felling of trees, constructing dams on rivers and streams and for building their homes (known as ‘lodges’) in the resulting pond. 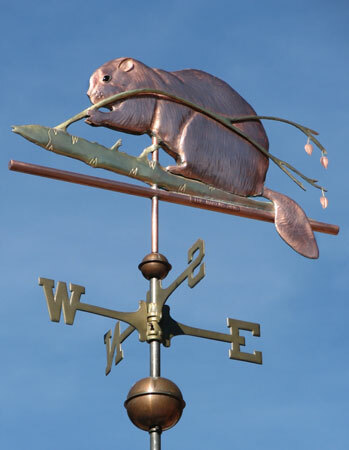 Not surprisingly, our Beaver Weathervanes tend to end up in settings associated with beavers. These have included homes with beaver ponds on the property, parks and interpretive centers showcasing beavers and their habitats, as gifts for folks whose nicknames are ‘Beaver’ and for those whose school mascot is a beaver. Over the years, we have made this weathervane in the large (~3-foot sculpture piece), medium size (~2-foot sculpture piece) and small size (~1-foot sculpture piece). 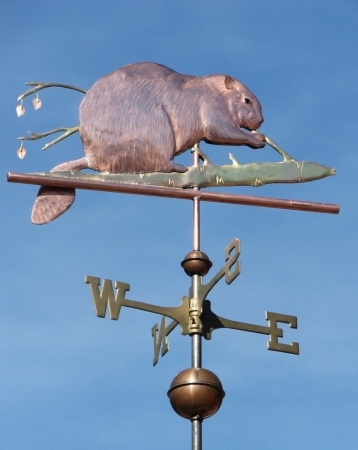 While I like all of them, I do confess to being partial to small version of this weathervane; it is absolutely adorable! We offer a wide range of water loving creatures in our weathervane repertoire. The beaver weathervanes closest ‘relative’ here at West Coast Weather Vanes would probably be our River Otter Weathervane but we also offer dragonflies, egrets and herons, frogs and turtles and trout, just to name a few. 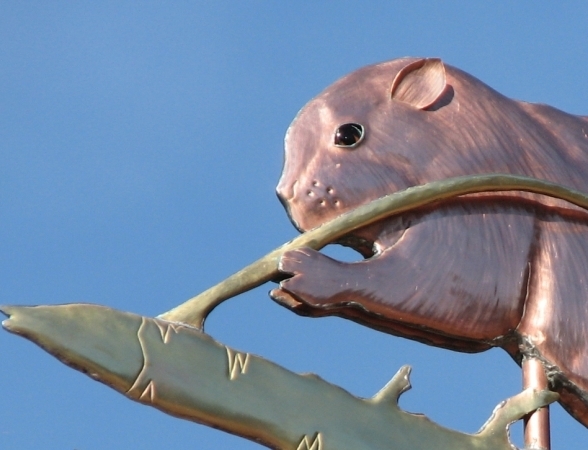 With a big enough budget and vision, we could even create a virtual weathervane wildlife habitat in just the right location.